I love dark things, and I love period pieces. I love the paranormal side of life, and I love the Victorian era. I love intrigue, and I love romance. So what did I do? 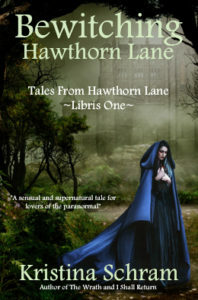 I incorporated all that wonderful stuff into my latest series: Tales From Hawthorn Lane, a sensual saga that takes place in the dark and magical village of Hawthorn Lane – a sanctuary for the fey. Although it’s modern day, the villagers live as though in another time, with long dresses and twirling cloaks, crackling fires and fancy carriages. Trouble’s always brewing in this beguiling world, where light and dark are in a constant battle for control. Lorelle Gragan, the main character, struggles to find herself, to shed her mask, to believe in love in this strange and chaotic world where nothing is as it seems. Beneath the facade she wears to protect herself lurks a powerful sensual force that’s just waiting to break free, and when it does, nothing will ever be the same for her or the residents of Hawthorn Lane. While attempting to escape her miserable existence in the human world, Lorelle stumbles across Hawthorn Lane. In exchange for a new life in this unusual place, she is trained as a gatherer of secrets for a powerful witch. But there’s one secret Lorelle must keep to herself—there’s not a drop of fey blood in her body. When the aristocratic Van der Daarke family unexpectedly returns to Hawthorn Lane after fleeing the village a century ago, Lorelle is ordered to find out why they’ve come back, and why now. Luck is on her side when a young Van der Daarke, frightened and bewildered by this strange world, runs away and ends up at Lorelle’s door, ripe for the exploiting. But Lorelle doesn’t count on having to deal with the formidable Kyran Van der Daarke, the runaway’s uncle and a man with his own secrets. Feeling both attracted to the high-born and repelled by his blue-blooded arrogance, she’s caught between wanting to learn what happened to his family and avoiding the proud man at all costs. It’s only when danger threatens the village that Lorelle at last solves the mystery…but the answer comes with a price as she discovers a truth about her own family’s past that could end the life she’s made for herself in the bewitching world of Hawthorn Lane. I invite you to visit this fey-filled village, where strange creatures and dark souls, a heart-torn fiend and an amorous witch, a distinguished Count and a simple gatherer, all live side by side, and where mayhem and magic rule as king and queen. Just click on the pic of the book to get transported to another world! Hi Ho Silver, I’m Going Gray!